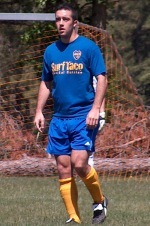 Brandon Schaefer was a part of the tough defensive corps of the Boca U23 men’s team who picked-up two wins on Sunday afternoon at the Manchester Soccer Complex in their second week of play in the Mid-Atlantic Summer Showcase League and remain undefeated in league play after four games. MANCHESTER TWP, NJ (June 11, 2006) – The Jersey Shore Boca U23 men’s team picked-up two wins on Sunday afternoon at the Manchester Soccer Complex in their second week of play in the Mid-Atlantic Summer Showcase League (MSSL) and remain undefeated (3-0-1) in league play after four games. In the first match of the afternoon, Boca hosted a very skilled PDA Hawks side from North Jersey. In the 10th minute, Boca’s Sean Cahill (Whiting) pushed up from his right outside back spot while an attack was in progress. After the PDA goalkeeper made a punch save, the tough-nosed defender who will be a senior at West Virginia University in September, corralled the loose ball about 12 yards out and buried his first goal of the season to the near post. Boca’s Andy Perez (Brick) tallied the eventual game winner in the 18th minute when the LaSalle University junior took a cross in stride from Jay Mancuso (Toms River) inside the six yard box and one-timed a low shot past the PDA keeper. The first half ended 2-1 in Boca’s favor after a miscue by Dan Haydu (Toms River) on the defensive right side allowed a PDA attacker to win a ball inside the penalty area and beat Boca goalkeeper Jon Curry Edwards (Spring Lake Heights) one-on-one for their only goal of the game. Boca finished-off the scoring in the last stanza with a second goal from Perez in the 60 minute assisted again by Mancuso along with Syracuse University senior Andrew Hawtin (Toms River) on a pretty 3 touch play before Towson University’s Andy Fraggos (Marlboro) knocked in an unassisted goal in the 79th minute after a scramble inside the box to make the final 4-1 Boca. In the final match of the afternoon against the NJ Rangers (Denville, NJ), Boca was first on the scoreboard again the 9th minute when Mancuso converted this second goal of the day on a nice give and go outside the penalty area from Bucknell University sophomore Mark Schmiegel (Toms River) and Stevens Tech junior Versh Tivzenda (Marietta, GA). The Rangers tied the match mid-way through the first half when Boca could not clear a ball out of their defensive third which found its way to a Rangers’ player about 15 yards out who slotted a shot beyond the out-stretched arms of Boca keeper Chris Konopka (Toms River). Boca re-gained the lead for good with four minutes remaining in the first half when Stevens Tech senior George Gkionis (Jackson) won a ball on the right side, pushed by a Rangers’ defender and served a perfect 40 yard cross to Fraggos at the far post who tucked-in the game winner for his second tally of the afternoon. In the 80th minute, Boca picked-up an insurance goal from Curtist Joseph (Lakewood) assisted by Justin McGrath (Brick). Throughout both games of the afternoon Boca’s defensive corps of Cahill, Hawtin and Haydu along with Stevens Tech junior Brandon Schaefer (Albuquerque, NM), Syracuse University senior Tyler Stoviak (Malvern, PA), Assumption College senior Jim Coletti (Warren) and NJIT junior Dan Bautista (Howell) made their presence felt limiting the scoring opportunities of both PDA and the Rangers. After four league games, Mancuso leads Boca in scoring with 2 goals and 2 assists, followed by Fraggos and Perez with 2 goals each while Gkionis has one goal and one assist. The Boca goalkeeping tandem of Konopka and Curry-Edwards maintain a combined .075 goals against average allowing only 3 goals between them in four games. MSSL is a third year regional soccer league fostering high-level competition during the summer months at both the youth and adult ages in both men’s and women’s divisions. Next Sunday the Boca U23s travel to New Brunswick for two MSSL games against the Jersey Knights (NJ) and Atlantic City Diablos (NJ).